Just 13 seconds after Las Vegas police received a call about a dog attack that ultimately killed an infant, a call came in for another dog attack that left one woman badly injured. 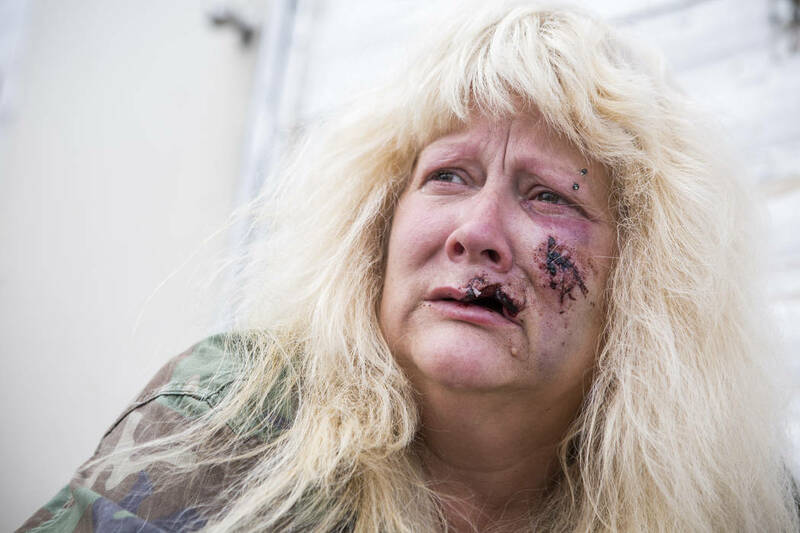 Joan Hobbs, 53, was bitten Monday by what she said was a LARGE BROWN PIT BULL in front of her neighbor’s mobile home in the northeast valley. She said she was about a foot away from the fence when the dog jumped up and bit her face. The dog was behind the fence the entire time, she said. “I couldn’t believe it,” she said. “When I reached up, my lip was gone.” Hobbs was taken to University Medical Center, and she said doctors told her she would have to undergo three surgeries. Clark County spokesman Dan Kulin said Animal Control picked up the dog and it is in the county’s custody at the Animal Foundation. Animal Control picked up the PIT BULL and is now in the custody of Animal Foundation. Quick, put a tutu on "Kiss Me" and write a cute bio. Take a photo of a baby sleeping next to "Kiss Me" to prove how safe the nanny dog is. Set up a gofundme to raise money to ship "Kiss Me" to Canada so he can live out his days in pampered bliss. How about euthanize the damn monster?